I have a thing about bridges. An armchair analyst would probably trace it back to my childhood trips across the Throgs Neck (or Frog’s Neck, as I called it), on the road to Uncle Buddy’s house in New Jersey. My older brother would work hard to convince me that we were going to drive up the cables, over the towers, and then come speeding down the other side. And even though history didn’t support this outcome, it took hold in my imagination. So here in my adulthood, I admire bridges as physical objects. I value them as versatile metaphors. But my grip on the steering wheel tightens each time I need to drive over one of any length. 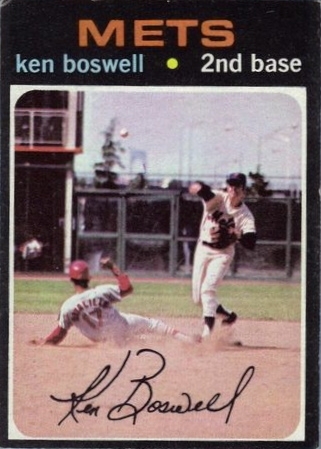 For these reasons, my relationship with this 1971 Ken Boswell (and the same year’s Dal Maxvill, its doppelganger) has always been complicated. On the one hand, there is the cool action photo, with clouds of dust being kicked up in the center of Shea. On the other hand, rising in the background like a beast of dread and majesty is the Whitestone Bridge. If you substitute the Verrazano-Narrows Bridge, all 4,260 terrifying feet of it, I could have written this post. And I love the 1971 Topps set. Yeah, the black borders are a collector’s nightmare but great shots throughout the set, without the need to put “In Action” by them like a year later. And the backs had a picture and SB numbers on them. And perhaps my favorite thing of all – the coins they inserted into the packs. I spent more time playing games with those coins than just about any toy that I owned. Same with me on the Verrazano, i still hate to drive the top. The Bridge that white knuckles me the most now is the Skyway Bridge in St. Petersburg Fla. I don’t remember coins in my baseball cards, only the extra crispy gum.